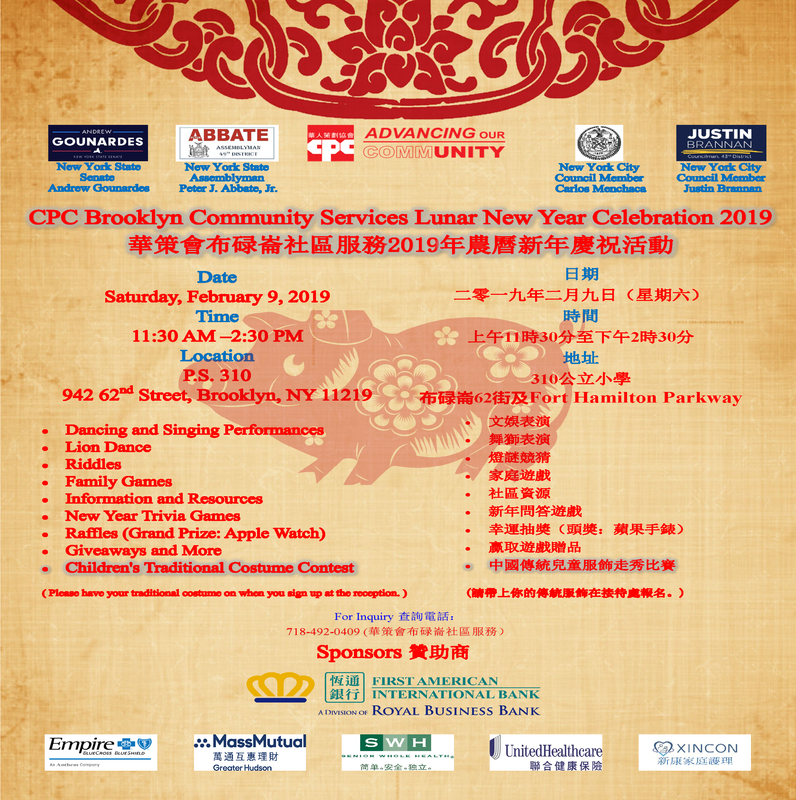 CPC Brooklyn Community Services, in partnership with the Offices of Senator Andrew Gounardes, Assembly Member Peter Abbate, Council Member Carlos Menchaca, and Council Member Justin Brannan will be hosting our Annual Lunar New Year Celebration on February 9th, 2019 at PS 310K, located 942 62nd Street, Brooklyn NY 11219. The Lunar New Year is a wonderfully colorful and vibrant eastern holiday that showcases the beauty and richness of the Asian culture and celebrates the importance and appreciation of family and friends. CPC Brooklyn Community Services hopes to engage our community into learning more about Asian heritage and the meaning behind the traditions we uphold by means of a Lunar New Year Celebration. There will be many activities and live performances planned for this event. We will be featuring quality service vendors, family activities, traditional paper lantern arts and crafts, lion dances, martial arts performances, family games, traditional music and dance, entertainment, interactive games and more! Our celebration is the perfect spot for a family outing. All attendees will also be eligible to join our free raffle prize drawings, including our grand prize of an APPLE watch, and receive incredible giveaways. This will be a free and open community event, easily accessible for people of ALL ages, ethnicity and culture so we encourage and invite everyone to join us! We are excited to ring in the Year of the Boar with our Friends, Partners, and Community Members. Here's to to good health and prosperity for 2019 and beyond. Special thanks to our sponsors from First American International Bank-A Division of Royal Business Bank, Mass Mutual, Empire BlueCross BlueShield, Senior Whole Health, United Healthcare, and Xincon.